Our enterprise is engaged in offering the customers Automatic Jar Filling Machine. These are designed and manufactured by a competent team of engineers with perfection making use of advanced technologies and quality raw material. Our professionals ensure that only defect-free range is delivered at the clients' end within the promised time. Since 2004, we U. V. Tech Systems an accredited manufacturer, exporting of Water Treatment Plants and Bottle Filling, Blow Molding Packaging Machines. 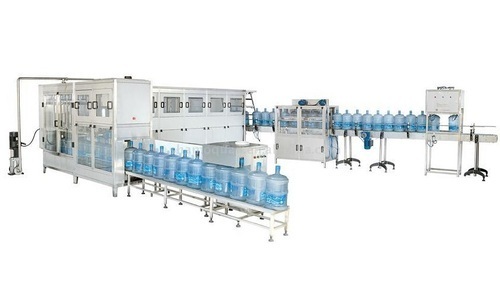 The range offered by us encompasses Reverse Osmosis, Ozonator, Doser, Dosing Pumps, UV Units and Semi Auto Rinsing, Filling And Capping Machine. In addition, we offer Semi Automatic PET Bottle Blow Molding Machine, Automatic PET Bottle Blow Molding Machine, Blow Moulding Machine, Wrapping Machine, Pouch Filling Machine and much more products to the customers. All our offered products are machines are designed and manufactured under the supervision of professionals using advanced technologies and components. Further, water treatment plants offered by us are appreciated among the customers for their features like robust construction and low maintenance cost. We also provide Quality Services to our customers. Being a customer-centric enterprise, we strive hard in attaining the satisfaction of our valuable patrons. We make sure that only defect-free products are delivered at the patrons' destination within the scheduled time making use of widely spread shipment network. In order to meet the customers' exact needs, we offer our machines in varied specifications and sizes. Owing to the client-oriented approaches and timely delivery of orders, we have been able to muster a huge clientele such as Bisleri and Parle Bailey.